FORUM-ASIA’s Working Paper Series 4 aims to provide a historical perspective of the concept of development as human right, as well as highlighting critical issues and ways forward for the realisation of the Sustainable Development Goals (SDGs). The 2030 Agenda envisages a world of universal respect for human rights and human dignity, and its 17 SDGs commit to tackling critical interconnected human rights issues such as poverty, peace, inequality, gender, poor governance and discrimination, as well as climate and environmental ones. With this set of ambitious goals and targets, the protection and promotion of civic space and human rights defenders are a crucial precondition for the realisation of the SDGs. 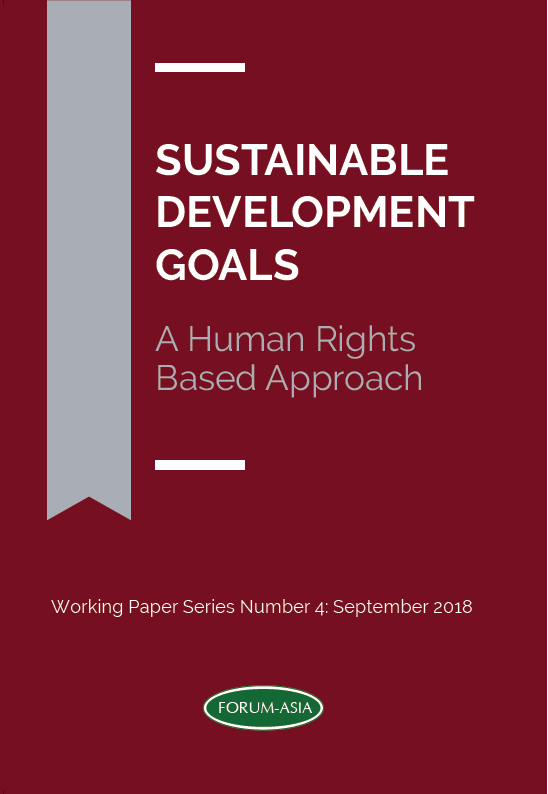 From providing an overview of national and regional trends and progresses, to analysing the role of national human rights institutions and the importance of gender equality, this working paper reinforces the idea that peoples’ rights should be at the centre of the development agenda, ensuring that present and future generations live in a fair and sustainable world.